Cardi B and Offset are officially engaged! Friday night (Oct. 27), during Power 99's Powerhouse concert in Philadelphia, the Migos rapper tapped his lady on the shoulder and began crouching down to pop the big question. Upon realizing what was happening, the "Bodak Yellow" rapper immediately lights up and the crowd goes wild, with Cardi giddily dancing before accepting an incredibly stunning 8-karat diamond ring. Naturally, the audience and the Internet respectively both went into a frenzy, with thousands taking to Twitter to react to the news as Cardi B excitedly embraced her now-fiancé on stage. 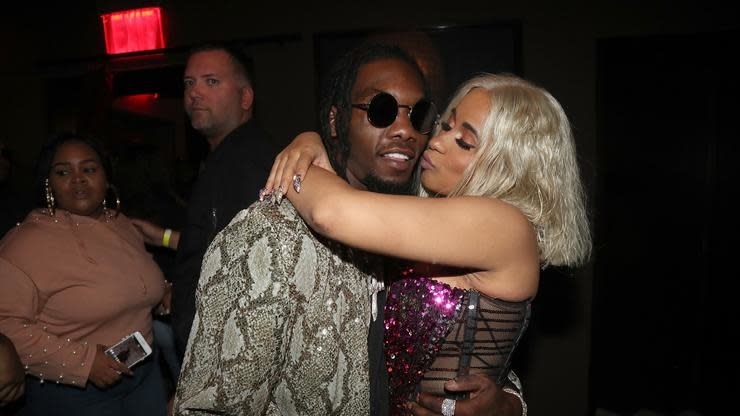 Cardi B and Offset have been at the center of engagement rumors for several months now, with the Bronx rapper addressing speculation at the 2017 VMA pre-show, explaining, "Every woman, I think, wants to get married and wants to have children. It's never too early to get married now. You know, if you want to propose to me, you can." Their proposal arrives several days after the couple broke up and got back together, with Cardi hilariously shrugging off the drama on social media and saying that the Bronx girl in her always has to go to extremes. Congrats to the happy couple and future husband and wife! Check out their special moment in the footage below.